The MLM Binary Plan is a most popular plan among MLM companies, network marketers, part-timers and members who want to earn through MLM business. 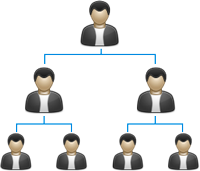 MLM (multi-level marketing) companies where new joiners introduced into Binary Tree structure i.e. one on left and another on right sub-tree. Generally, one side sub-tree is referred to as Power leg while other is Profit leg. Power leg grows with new member placement, even introduced by previously enrolled or ancestors. New members in the power leg placed under a leaf available node of the binary tree, when a member works to grow his Profit leg, some compensation distributed calculated by a formula using certain value matched with Power leg that may be 1:1 or 2:1. MLM Software India developed and designed lot of Binary Plan MLM Software for various fully satisfied MLM companies. Binary plan is most successful MLM plan in the Network Marketing History. MLM Leader love to work with binary plan because Binary plan support both down lines and up lines to build powerful Team in network marketing. Binary Plan is also support to generate large number of team as well as huge earning in MLM Industry. MLM Leaders can create power leg to boost the networking business with the binary concept. In current MLM Industry combination of Binary plan and Growth plan, Binary Plan with Bitcoin System (BTC Coins) is most popular and MLM Leaders like to work in Binary with Daily Growth system, Weekly Growth system and Monthly Growth system known as ROI System as well as Binary with social promotion concept, Daily Task System and Daily Job work System etc. MLM Software India provides free demo of Binary plan software to understand the concept of Binary plan, features of the software, structure of Binary Plan and the way of Generating best structure in Binary plan to get more benefits and more earning opportunity. Binary MLM Plan is the most exciting Plan among all types of MLM pay plans because of much more payouts. Binary Plan is a MLM Plan which pays to infinite downline. That means that a member will be paid by downline, even if the downline are 15 level deep in your structure. With a binary model, your upline will place their new members under you into what's called your power leg. This is referred to as spillover. Your power leg will usually grow quite quickly. Binary plan is great plan for nurture teamwork in a MLM organization. It plays an important role for you and your downline success. This build a team unity and cooperative energy. Binary Plan offer the greatest potential generational earnings depth of any of the four basic compensation plans in network marketing. You really only need to concentrate on building one let of your business- your "Money Leg". The other leg of you downline matrix or "Power Leg" is usually being built by those in your organization that are above you, and more experienced that you. The initial Binary Compensation Plan is much easier to understand and maintain qualifications for than other plans created before its' inception. Binary MLM Compensation Plans help the average and even more than average network marketers to be able to achieve success, and realize the potential for financial freedom. Binary MLM Plan is the most popular MLM Plan launched by many Multi Level Marketing companies, hence easy to understand for new MLM joiners and easy to explain by the MLM companies for their customers or members. Binary MLM Plan may be 2:1 or 1:1 based. It means the Multi Level Marketing companies can have variation for their profit sharing ration amongst customers. MLM Company can promote their business by growing one side new joiners that called power leg for their customers. With Binary MLM Plan the Multi Level Marketing companies can introduce other earning options for their customers or members like re-purchase MLM plan, Mobile, DTH recharge facility and many more features with Binary MLM Plan. Lots of earning options with the Binary MLM plan both for the customers and Multi Level Marketing companies. Multi Level marketing companies can introduce binary capping hence profit sharing can controlled through binary capping. Binary payment released may be daily, weekly or monthly basis depends upon the Multi Level Marketing company concept. Binary Placement with Extreme Left and Extreme Right Concept to create power leg in Genealogy. Binary Placement with sponsor id and Placement id to get extra binary income through which member / Leader can place ids with his/her choice to build powerful team. We have dedicated team and experts to make binary plan better for both MLM Leader and MLM companies and create user friendly environment.